This is my No. 2 value pick for 2017. Happy CNY to all. May the year of the Rooster of 2017 be a prosperous and wonderful year ahead for all. 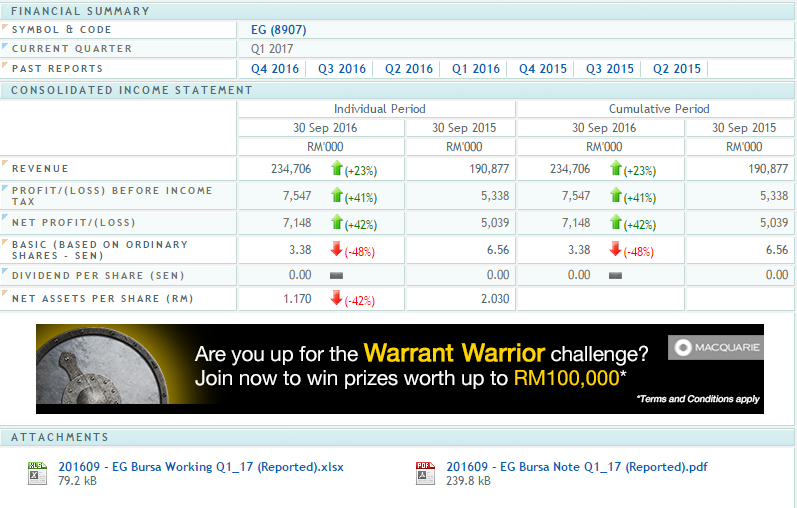 I still remember sometime end 2015, EG Industries was one of the hot stock that moved from 50 sens to RM 1.20 especially after many prominent investors revealed their holdings and view on this counter. After which, EG has been in a consolidation phase for the majority of 2016. There has been many write-ups as well on this stock which actually made me put off writing on EG as one my 2016 Value Picks. Additionally, there was a key factor which delayed my writing - The completion of their move from EMS to Box Building. In early 2016, many were bullish about EG and the future prospect. If one pays attention to the news reports, there is a good reason to. Dwelling into the details of the management's indication will show that the issue with EG is the timing. Of course, many would argue, if you are patient enough, any good value stocks would surely move up. I dare say, EG is one of them but with valid reasons. My main reason for putting off writing EG was because I wanted to see if management of EG actually can fulfill their promise and whether the management guidance given is credible. My concerns were addressed in the latest QR released on 30 Nov 2016. EG recent QR was nothing short of impressive. Revenue stands at RM 234 Mil and net profit stands at RM7 mil. Both figures for Q1 alone stands at 33% of the full year of 2016 Revenue and 40% of the Net Profit. 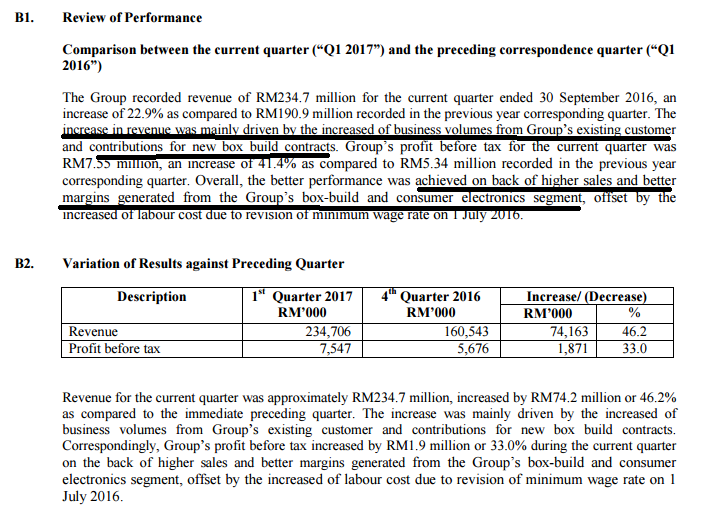 If one were to annualise, EG may return the peak revenue of RM 936 million in Revenue and highest profit in 5 years RM28.4 million. However, I would not annualise as that is too aggressive. Even with a conservative estimation, I am confident that the management new direction will allow sustained increased in the profit margin for the company to around 3%. Most importantly, I am very impress with the Management's ability to keep to their words. 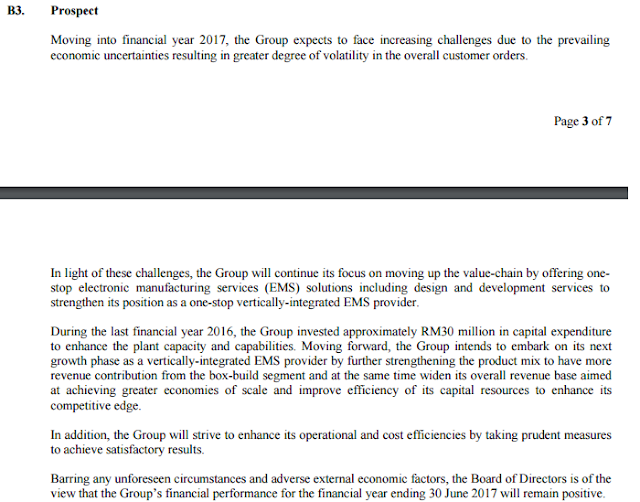 Below was the management guidance on the future prospect 2 quarterly report back. Today, the performance delivered shows the management actually kept to their words. 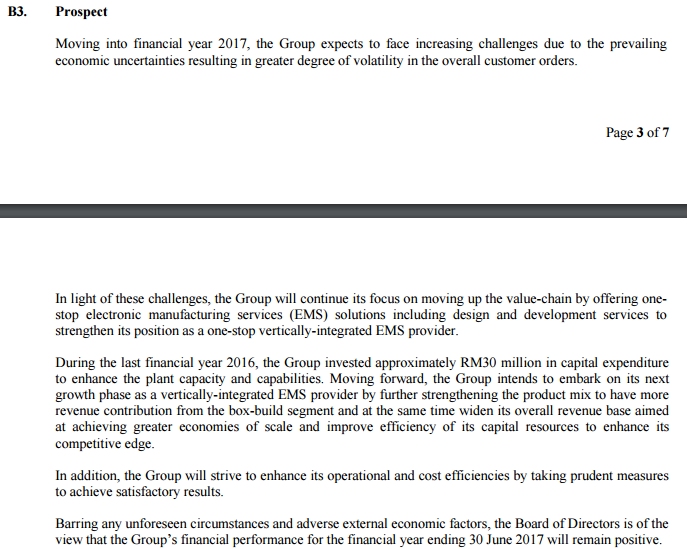 Fact of the matter is EG management manage to live up to their promise in their transition from EMS to Box Building. 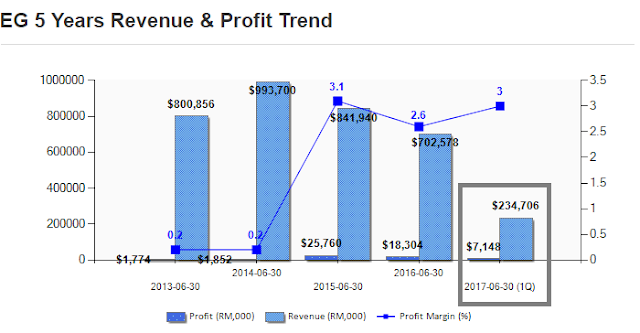 The new product mix helped increased both revenues and profit margin. As such, the company is indeed moving in the right direction. Many have asked me how did I come to discover Visdynamics, my question is look at details in the annual report that people do not. After which, cross check that information and verify if the management is indeed running the business well. Quite clear, EG is on the right track with their business plans and strategy. Of course there are two issues I would like to highlight to all. One is the impending rights issue / private placement. Two is the sell off by CIMB Small Cap fund recently. EG done a rights issue at 50 sens in 2015 and private placement at 80 sens. There is news recently that EG wants to do another round of rights issue / private placement. 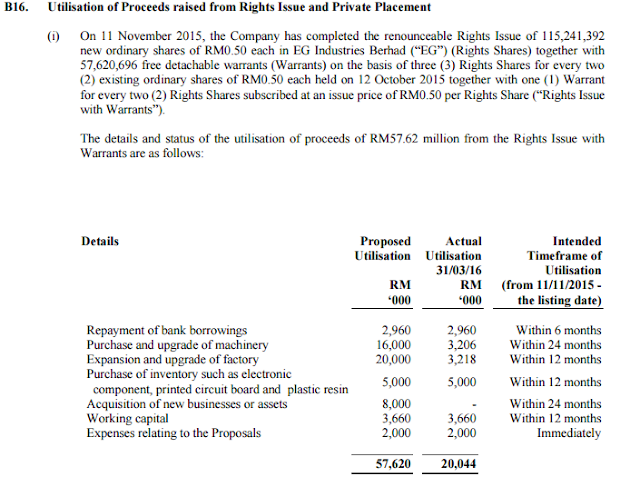 While I understand the company has financial needs to manage the cashflow, however, both timelines are too close. Raising funds from the public to expand business is good. 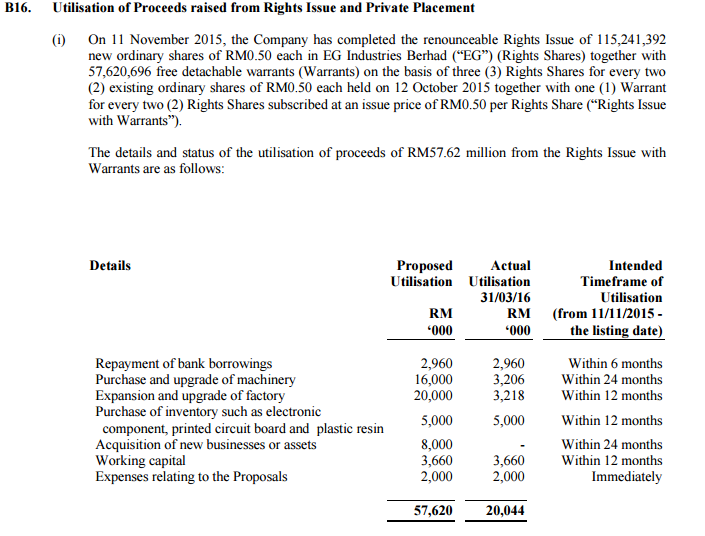 Nonetheless, I would have preferred if the management plan their fund raising properly and think through a longer term business plan such as coming up with 5-10 years strategy instead. 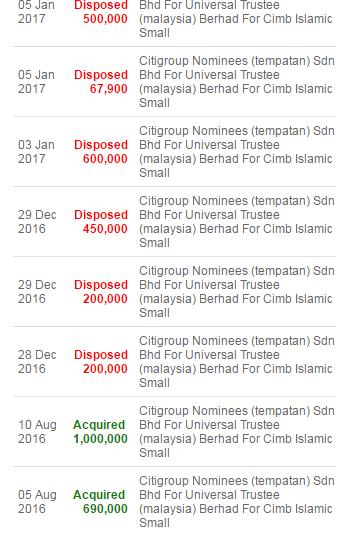 Secondly, the sell off by CIMB after this news surfaced does not exactly instill confidence in the market investors. While this is not pleasant, I am of the view that readjusting portfolio by funds are very normal especially at the end and at the start of the new year. EG has not been declaring dividends and the price has been stagnant for the large part of 2016. I cannot blame the fund manager who rather put their money elsewhere. However, as mentioned many times before, Tradeview is a value investing group that look long term beyond the immediate gratification. As such, I believe there is room for EG's business to grow. Measure taken by the company also shows that direction. 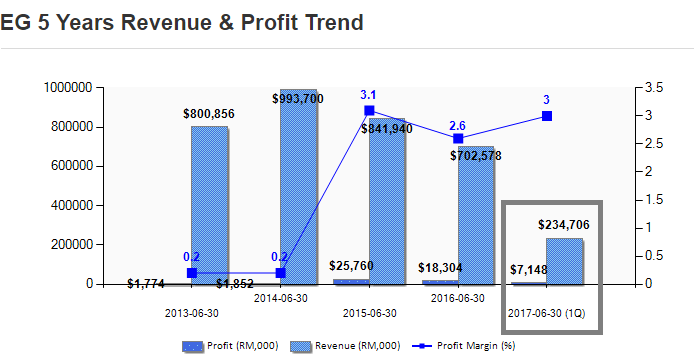 At current price of RM0.86, EG is only trading at 6.5x trailing P/E while on a P/B basis at 0.74x. If I choose to be more conservative and take only the last 2Q and annualise it, it would be trading at 7.6x forward P/E. Both valuations shows EG is undervalued. There is no dividend by EG which is a downside for many funds / institutions. 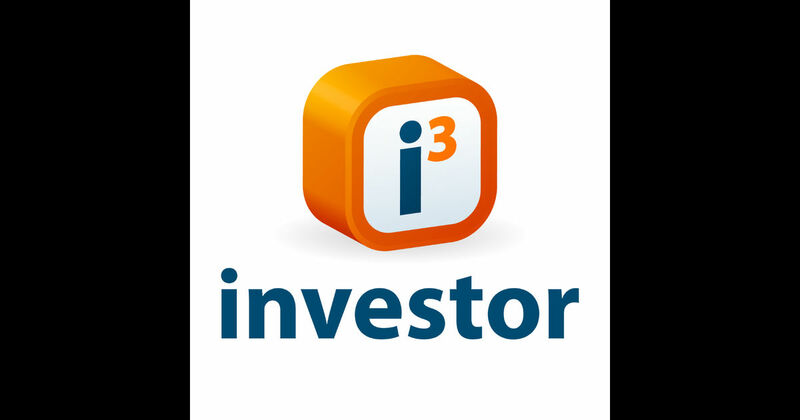 However, buying into growth stock is where one aspire for the capital gain to provide the good return. I believe, if EG continues to sustain the last 2Q's performance, 2017 will likely be the first year EG declares dividend. Nevertheless, management has not established any dividend policy and investors have to be patient on this. Based on the latest QR, I am of the view that EG's Fair Value should be around RM1.13 trading at 10x PE. I will set the initial TP for 2017 to be RM1.10 for ease of reference. The recent selldown in price of EG is likely due to portfolio rebalancing by CIMB Small Cap Fund after holding large position of over 2 million shares in the counter. For them to be selling off now probably is because there is 1. No Dividend issued to date 2. EG has been stuck in the narrow band for almost 1 year 3. Due to the impending corporate exercise / private placement / rights issues. In any case, the market is efficient and I feel it have already priced in the negatives. What the market failed to appreciate is the timeline promised by management where earnings start to reflect the new contract + Box Building business growth. Any price weakness, may be a buying opportunity. Part of the reason why some people still struggle with what it means to be a Business Analyst is because it is a very diverse career by definition. Business Analysis is his comment is here very clearly in the IIBA (R) BABOK (R) guide, and yet, if you read this guide, you will agree that there is enormous scope for a Business Analyst to do a wide variety of things with their careers. So let's look at some of the aspects that make our careers so diverse and interesting.